After severe backlash from Jewish groups, indie devs stop production on their in-development Auschwitz game. 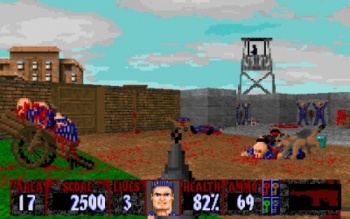 The game Sonderkommando Revolt, a Wolfenstein 3D mod based on the real, failed uprising of Jewish prisoners in Auschwitz, was to feature a lone prisoner gunning his way through countless Nazi guards, featuring "Crematoriums, Block 11, Gas Chambers, execution, interrogation and torture areas ... most of which are ripped/based off real pic [sic] from the real site," according to one of the developers, Doomjedi. The Anti-Defamation League immediately took offense to the game, telling Kotaku that the Holocaust is off-limits for videogames, and that Sonderkommando Revolt is a "crude effort to depict Jewish resistance during this painful period which should never be trivialized." Attempting to assuage the ADL, the creators Team Raycast and Maxim Genis said that the game was just "blast the Nazis fun" and "very realistic, moody, challenging and detailed." But the ADL kept pushing, and now Sonderkommando Revolt will never see the light of day. Genis, who claims to have lost family members in the Holocaust, has stated, "I did a lot of research for the game. I wanted to show the Jews really did fight back against the Nazis. I wanted to honor them. My intentions were pure and pro-Jewish in every way." While most do not mourn the loss of yet another mindless Nazi shooter (particularly if it's just a mod for a game that came out in 1992), the fact that the ADL believes that the Holocaust is entirely off-limits for videogames has some gamers rather upset with them, particularly the "games as art" crowd.